Hurricane Irma hit the Florida Keys this morning with sustained winds of 130 miles per hour, making it a category 4 storm on the Saffir-Simpson scale. Hurricane-force winds extend 80 miles from the center of the storm while tropical storm-force wind reaches outward 220 miles. A 120-mph gust was reported on Big Pine Key while Miami International Airport had sustained winds around 60 mph and gusts approaching 100 mph. South Carolina is expecting to see winds increase later today. The state's department of transportation is urging drivers to be cautious as trees, limbs and other debris could litter roads. By later today, the center of the hurricane will be over or near the west coast of the Florida Peninsula. While the storm will weaken on its current path, it will remain a powerful, dangerous hurricane. Irma is moving northwest at 9 mph however the storm is expected to accelerate today. 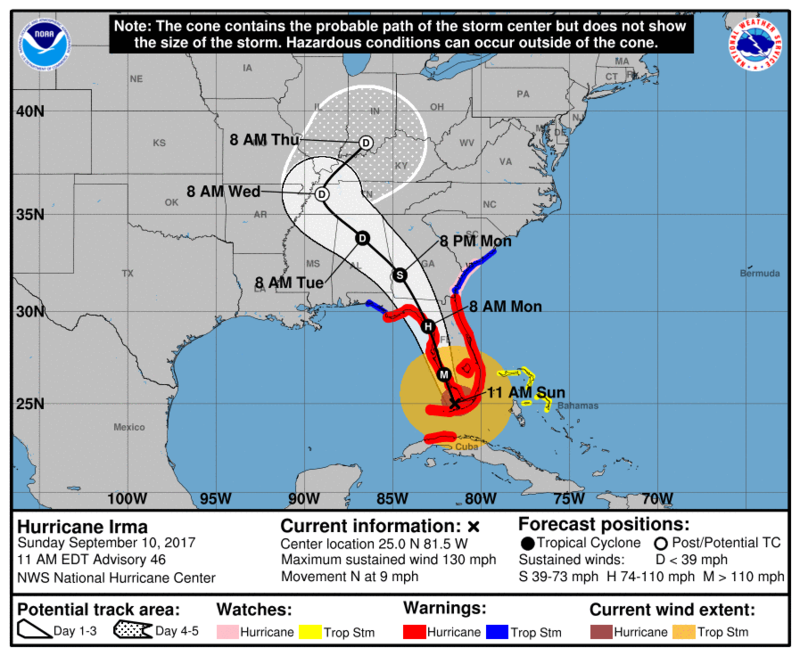 By Monday afternoon, the hurricane will move inland over northern Florida and southwest Georgia and begin to lose strength. Flooding is expected as the normal tide, along with storm surges up to 15 feet, move inland to areas that usually remain dry. Hundreds of thousands of people are without electricity, with more outages possible as the full effects of the hurricane are felt. Emergency crews have stopped responding to calls for help in some areas due to dangerous conditions. 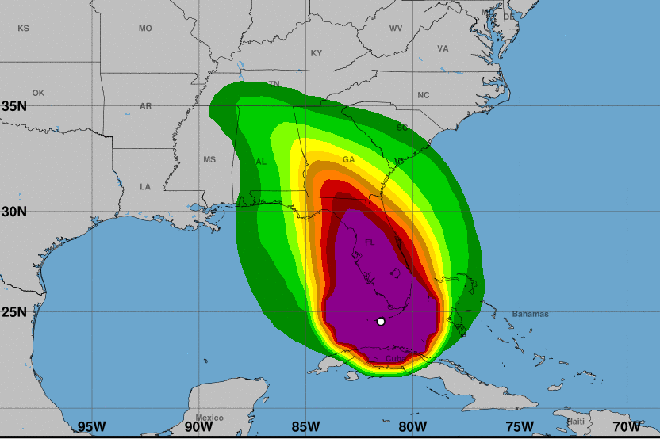 Florida Governor Rick Scott has been on an extensive media tour most of the week urging residents and visitors to heed evacuation notices issued by local authorities. 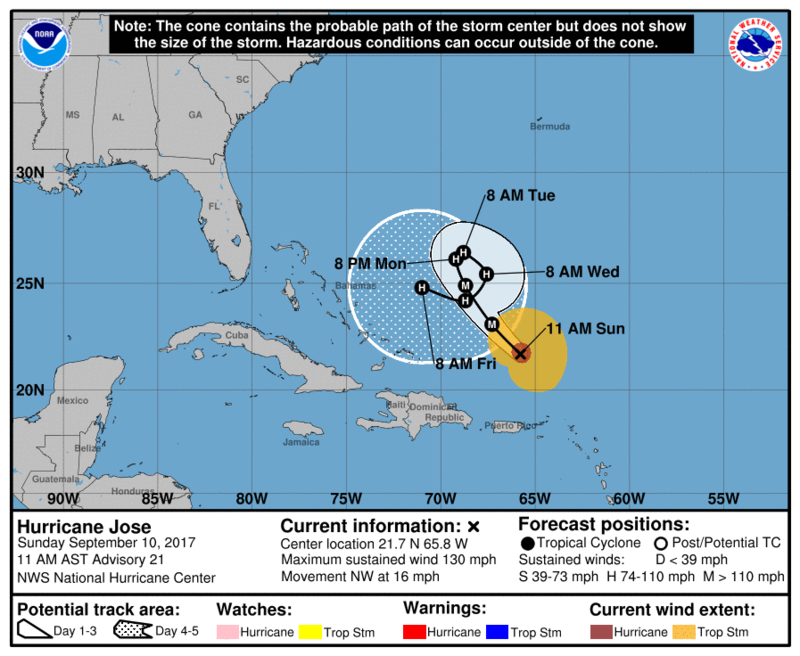 Elsewhere in the Atlantic, Hurricane Jose is a category 4 major hurricane. The system is located north of Puerto Rico heading northeast on a projected path that shows the storm making a loop later in the week before returning to a northeast track late in the week. The American Red Cross Safe and Well program is available to people impacted by disasters to help re-assure family members about their wellbeing. Those in an impacted area can register on the site, and family or friends can check their status. The site will display the first and last name as well as the date of last contact based upon a successful search. Phone calls to areas impacted by a disaster should be avoided; lines may be down or overloaded. Text messages are often the best way to make contact with people in a disaster zone, but keep in mind that cell towers may also be down. Colorado has sent nearly 50 people to Florida and Georgia over the past week to assist with the response the Irma' impacts. See our article about how you can help in a disaster.